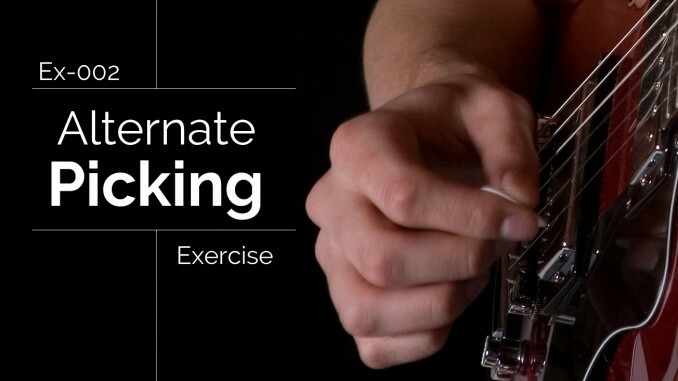 The goal of this exercise is to improve the speed and accuracy of your alternate picking. Go slow enough to play it perfectly before increasing the speed. The following picking combination should be used: d, u, d, u, d, u, etc. where d = downstroke and u = upstroke. This audio cannot be played because your browser does not support HTML 5 Audio. Alex, I have some content coming. Please use the links in the side-bar to follow me on facebook and twitter to get my new content announcements. I have a couple licks, exercises, and lessons coming that may help you.